Rhodesian ridgebacks were originally bred for use in lion hunts, which explains why these these dogs are strongly built and robust. They are nevertheless vulnerable to the genetic consequences of the selective process that produced the breed. For example, around 2% of ridgebacks develop a very specific form of epilepsy. The first signs become manifest in growing dogs as frequent, involuntary muscle twitches. Around one-third of those affected go on to display the symptoms of classical grand mal epilepsy, i.e. generalized seizures. In fact, LMU researchers have now confirmed that these dogs suffer from a form of generalized myoclonic epilepsy. To do so, they made use of a novel combination of video monitoring and electroencephalography (EEG), which was specially modified for use in dogs. The method allowed the team to simultaneously track the electrical activity in the brain and the dogs’ motor activity. In international research effort led by veterinary neurologist Professor Andrea Fischer (Small Animal Clinic, LMU Munich), molecular biologist Professor Hannes Lohi at the University of Helsinki and veterinary neurologist Professor Fiona James of the University of Guelph, and including physicians and neurologists went on to identify the genetic basis for the syndrome – a defect in a gene which apparently plays a significant role in the modulating the action of the neurotransmitter acetylcholine. The study appears in the leading journal PNAS. A large set of genes involved in the pathophysiology of epilepsy has already been identified in dogs, which suggests that the condition has a multifactorial basis. However, the mutation responsible for the disease in ridgebacks behaves as a simple autosomal recessive: When dogs that carry one copy of the defective gene are crossed with one another, on average one-quarter of the litter (i.e. the pups that inherited the defective version from both parents) will develop symptoms of the disease. Epilepsy, which results from uncoordinated activation of large collections of neurons in the brain, is actually the most prevalent chronic neurological syndrome found in dogs -- and most of these conditions show a strong genetic component. This is not surprising, in light of the selective processes that gave rise to the large number of existing breeds. Many of these were originally derived from crosses between small numbers of founder individuals. Moreover, each breed represents an isolated population with a highly homogeneous phenotype and correspondingly low levels of genetic diversity. This in turn means that deleterious genes cannot easily be eliminated from the population and can therefore persist for a very long time. However, identification of the gene responsible for the form of epilepsy found in ridgebacks means that a gene test is now available, which should help to reduce the incidence of the condition. The test enables healthy carriers of the defective form of the gene to be identified, so that crosses between two such carriers can in principle be avoided. 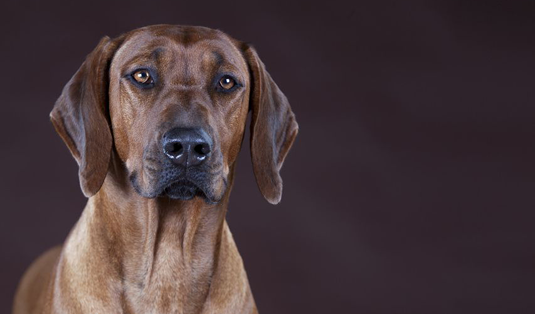 Both the gene test and the video-EEG procedure should also help veterinarians to diagnose and treat affected Rhodesian ridgebacks as early as possible. The discovery of the mutation in Ridgebacks promises to throw new light on the causes of epileptic syndromes in humans, as a homolog of the canine gene is present in the human genome -- which may also be a candidate gene for epilepsy, say Lohi and Fischer. Moreover, the authors of the study point out that the symptoms of the condition observed in ridgebacks are comparable to those seen in cases of Juvenile Myoclonic Epilepsy (JME), one of the most common forms of the disease in humans. In both cases, muscle twitching is bilateral, arrhythmic and often asymmetrical, and involves the arms and the trunk. In addition, the EEG traces are similar. Both forms of the condition are also characterized by sensitivity to light, as revealed by clinical examinations of affected ridgebacks by pediatric neurologists at the Epilepsy Center in Vogtareuth. Furthermore, the epileptic episodes tend to occur upon wakening from sleep. Further investigations of the function of the gene product should not only help to elucidate the pathophysiology of the various forms of myoclonic epilepsy, but might also provide pointers for the development of new approaches to the treatment of these conditions.